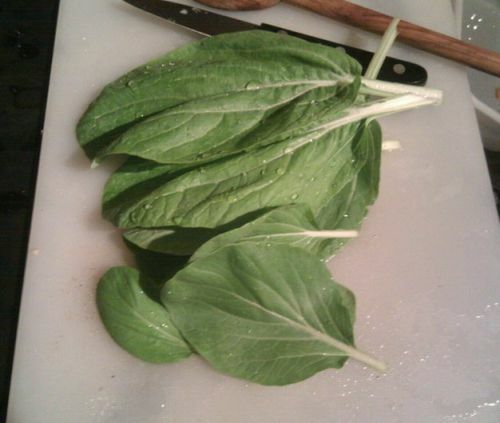 After a very tiny spinach harvest, it was nice to be able to pick a few bok choy leaves and cook them up with dinner last night knowing that there would still be enough more for at least a few additional meals. 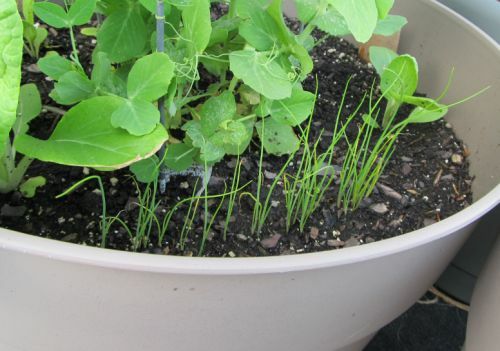 I’m a little concerned that the growing season appears to be shorter on the rooftop than it would be on the ground. It’s colder and windier on a roof three floors up than it is on the ground, so it takes a while for plants that normally like March weather to get started… and then when the spring hits the plants get blasted by bright sunlight without much shade. I’ll try spinach again in the fall and see if I can do a better job, but it looks like bok choy is a little more tolerant of my rooftoop conditions. 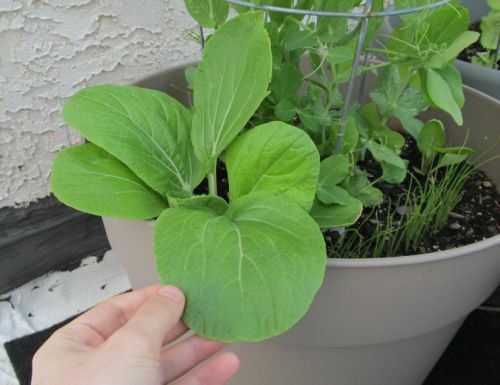 Interestingly I have four large planters on the roof, and the bok choy and snow peas in one pot have been growing far larger than in other planters. I don’t know if it’s because of the soil mix, the sunlight, the shade, or some other variable, but through trial and error hopefully I can figure it out. All in all I’m just happy that anything is growing. 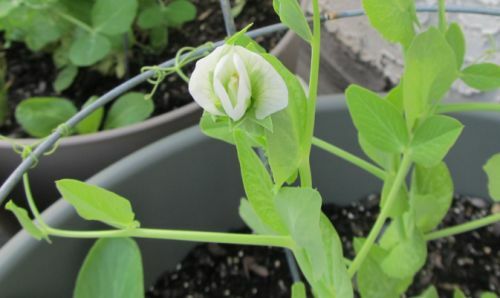 The snow peas are starting to flower, which means I should start to get actual pea pods soon. The onions are growing much more slowly than I would have expected — but I think I might need to thin the crop a bit to give these little guys more room to breathe. They may be called bunching onions, but the bunches are looking awfully tight at the moment. 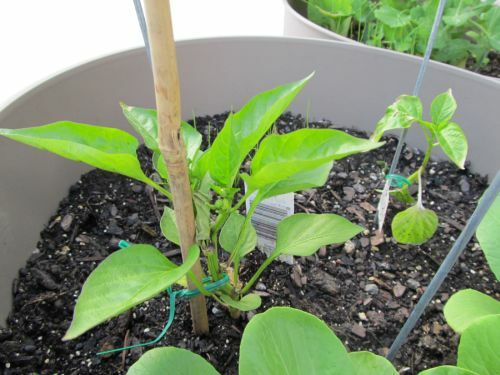 I put some peppers outside about a week and a half ago to see what happens… two seem to be doing OK while a third plant looks like it might be dying… but I’ve got a few more plants in the house and I plan to bring them outside once it gets a little warmer — and perhaps once I’ve harvested some snow peas. I may need to cut down some peas to make room for the peppers. I also snuck a couple of green bean seeds into the planters last night. They’re basically the warm-weather alternatives to snow peas. 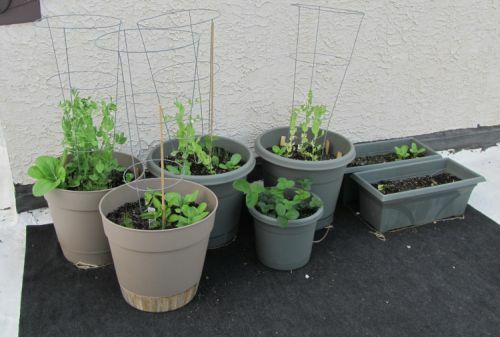 By the time they’re big enough to start competing with the snow peas for space, it should be time to remove the peas anyway. 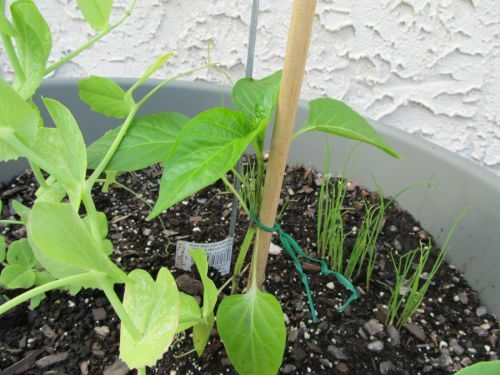 My goal is to grow peppers in two large planters and beans in the other two, while keeping some onions going in the middle for as long as they’re happy. Oh yeah, here’s the small planter with strawberries I set up a few weeks ago. I don’t have high hopes for a crop this year, but I’m hoping to get them settled so that we can get some berries next year. 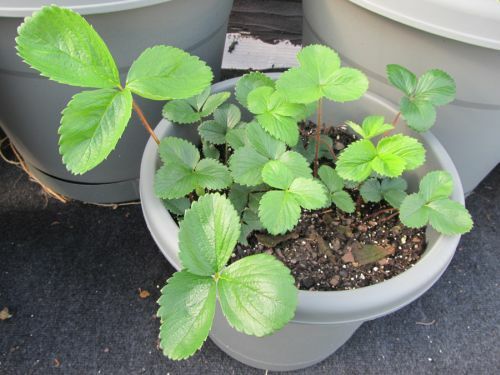 Once I really know what I’m doing I’m hoping to set up a potted blueberry bush as well — but I might wait until we’ve got a deck on the roof before doing that, since a bush is likely to grow as high as 4 feet tall.